Tuk-A-Way Condo is a spacious 4 bedroom, 4 bath condominium vacation rental located at the Olympic Resort Condominiums in Lake Placid, NY. This home was completely remodeled in 2007 and features lovely Adirondack furnishings throughout. The large bedrooms all have en-suite baths, there is a fully equipped kitchen with granite counters/hickory cabinets and the living room has a nice wood burning fireplace and flat screen TV. Visitors to this great rental are also able to enjoy use of a private patio with a chiminea and gas grill. The home is able to accommodate up to 8 guests and is within walking distance to the Whiteface Club golf course along with additional amenities that the Club offers. The Village Center with amenities, a variety of restaurants, the Olympic venues and 2 lakes is only a few minutes away or a 15 minute drive will lead you to the Whiteface Mountain Ski Center for a day on the slopes. Engel & Völkers Lake Placid Real Estate is a leader in the vacation rental business. We successfully manage a portfolio of 85-100 properties ranging from cozy cabins to luxury retreats. Our vacation rental specialists are licensed real estate salespeople with a thorough understanding of our region and visitor needs. Our management concept is founded on the highest standards of professionalism, integrity, accountability and quality service that guarantees the maximum return and attracts the best tenants possible. Our vacation rental division is committed to setting high-standards and ensuring that we provide the finest selection of properties to enhance our visitor’s vacation experience. We attribute our success in part to setting high-standards and by ensuring that we provide the finest selection of properties to enhance the visitors vacation experience. We are fortunate to work with many second home owners and visitors who predominantly come from the major metropolitan areas of NY, NJ, CT, PA, MA and neighboring regions in Canada. Let our professional staff handle all the nuances of renting your property. We produce results and our property owners are very satisfied. You can trust that we will do a great job for you. Our family enjoyed the rustic, Adirondack atmosphere that felt warm and inviting. The fireplace was cozy and there was plenty of seating in the living room area. We would have liked another loveseat or armchair though. The kids loved the bunk beds. The adults found their beds very comfortable. It was great to be able to adjust the temperature in each bedroom. The weather was great for sledding and playing in the snow. We were able to sled on the nearby golf course. Beautiful home with true Adirondack feel with every detail . Loved that it has a bathroom in every room. Well stocked . Excellent location to the Jack Rabbit trail for snow shoeing and skiing . Immaculate Adirondack Rustic styled condo with four bedrooms and four baths was perfect for family reunion of eight. Columbus day weekend was colorfull but rainy and it was wonderful to relax in front of a nice fire with the provided wood and firestarter. Easy access to town: we hiked Whiteface, toured lake, went out to three first class restaurants, watched ski jumps and went to High Falls Gorge. All appliances were provided and we took advatage of the washer/dryer after the hike. Plenty of seating for eight people for shared breakfast before setting out for adventures. Great stay! Six of us spent a long weekend at Tuk-a-Way. We were pleasantly surprised finding essential food items available. The beds and linens were comfortable. 2 bathrooms were spacious while 2 were a bit small for 2 people.Bath towels were not very absorbent but at least we didn’t have to pack them. We found the condo clean and cozy. Firewood was available. Although the rear of the property backs up to a road, there was little traffic. 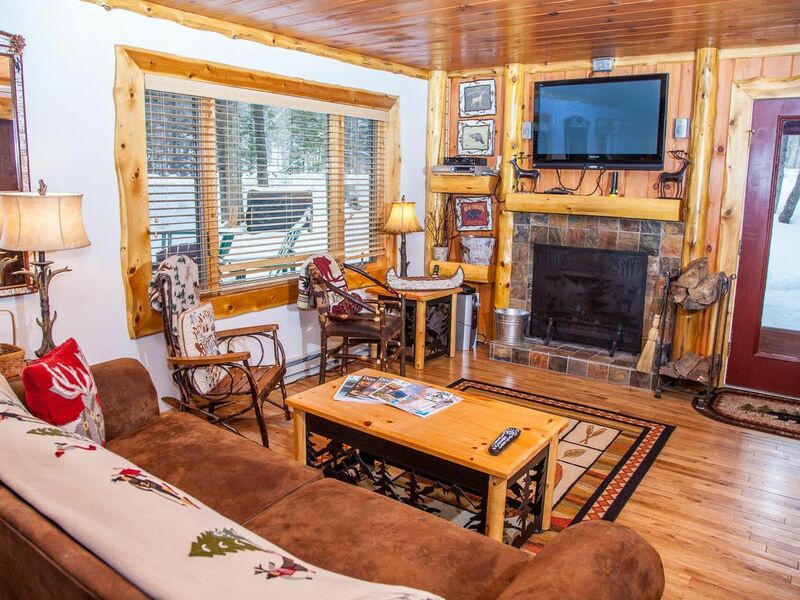 This condo is about 2-3 miles from town. The booking and checking in and out were easy. Living space was cozy but could use a comfy chair. We would definitely recommend this condo for a great get away. The property was lovely and very clean. We had a wonderful stay at the house. Everything was clean and tidy and looked just like the pictures. The only thing they could improve on is the seating in the lounge area. They need another comfy chair ect to hang out in as there is only one couch and the other chairs were a little hard to sit on. Overall beautiful property and I would stay there again.